The for Dummies series has been around since 1991. (A bit of trivia, DOS for Dummies was the first title.) 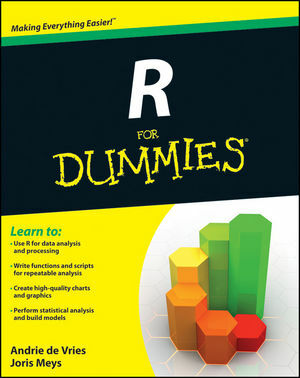 I’ve owned a few books in the series and have been adequately impressed with most of them, but when I learned there was an R for Dummies I was immediately skeptical. Possibly I was skeptical because R has a steep learning curve and many idiosyncrasies, so the idea of an R for Dummies text seemed oxymoronic – it’s difficult to imagine a (successfully) dumbed-down version of an introductory R text. But if you’re familiar with the for Dummies series, you already know that the moniker is just for marketing. In reality, these books usually do a good job of distilling a topic down to the important components a new user needs to know. This edition is no exception. The core topic areas that R for Dummies covers should come as no surprise: A basic overview of R and its capabilities, importing data into R, writing and debugging functions, summarizing data and graphing. In addition, there are sections covering potentially frustrating tasks for beginners such as working with dates and multidimensional arrays. I am a big fan of periodically reviewing the fundamentals. I pick up introductory texts every once and a while to make sure I haven’t forgotten anything important and R for Dummies is a nice edition to my library for that reason. One thing that sets this book apart from other currently available introductory R texts is that it covers a couple of recent and important developments in R coding – namely the RStudio development environment and ggplot2 graphics. If you’re not familiar with the for Dummies series, it is important to note that they are written in a specific informal style, which is in stark contrast to most R texts. (For reference, the style is more similar to The R Inferno than the ggplot2 manual.) You can get a sense of this style by browsing a few pages on Amazon to see if you find it helpful or distracting. On the other hand, R for Dummies has a more polished feel than many R texts I’ve read. I didn’t encounter any of the frustrating and distracting editing errors that are common in some R texts. R for Dummies is primarily focused on R as a programming language, so for the most part, statistical analyses are presented only as a means of illustrating programming techniques. Given its focus on programming and fundamentals, this book is highly recommended for someone with little to no experience in R who wants to learn R programming. Intermediate to advanced R programmers like myself who want a current review of the fundamentals, might also find it useful. I might also recommend R for Dummies to experienced users of other programming languages who are new to R. The discussion of basic programming concepts, such as control flow, is minimal and focused primarily on details specific to R. It is not recommended for those looking to learn statistics in conjunction with R.
The current price of $20 USD puts it in the middle price range for texts of its kind. It is available as a paperback or Kindle text (try Amazon).